This song is about finding lasting love. Life’s journey can be filled with heartbreak and many disappointments. However, once connected to the true source of love, we discover that lasting love finds us. 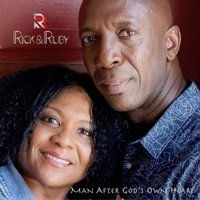 “Man After God’s Own Heart” is the first release from the upcoming debut album about life, love and relationships by RICK & RUBY. In our experience of life, we find that when we reverence and honor the one true source of love, we are then better able to connect with others we encounter on a deeper, more authentic level. The artistic presence of RICK & RUBY inspires compassion and hope in those who are lost in love. The musical artistry of RICK & RUBY is soothing to the heart and pleasing to the ear. I love this song! It feels good and tells the truth. I have so been there. Can’t wait for more from you guys! Thanks!